The Psalter was perhaps the best-known text among the Anglo-Saxons. As a result, many Psalters have survived from early medieval England. This blog post focuses on the Paris Psalter, which has been associated with Alfred the Great and features some beautiful illustrations. Paris, Bibliothèque nationale de France, lat. 8824 (the ‘Paris Psalter’) is a unique manuscript dating to around 1050. The main texts of the manuscript are the 150 Latin Psalms with facing Old English translations: the first fifty Psalms are translated into Old English prose and another translator rendered the last hundred Psalms in Old English verse. Although the Paris Psalter does not mention the author of the Old English Psalm translations, the translator of the first fifty Psalms has been identified as none other than Alfred the Great (d. 899). 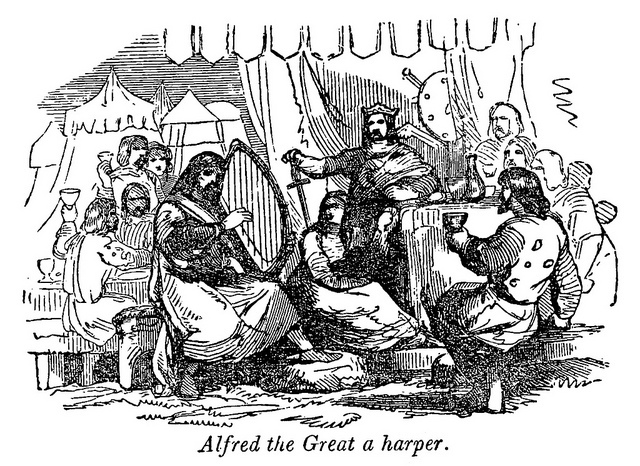 The arguments for the attribution to Alfred concern the language of the prose translations (a ninth-century West Saxon dialect) as well as a twelfth-century chronicler recording that Alfred was working on a translation of the Book of Psalms but had not been able to finish it before he died. I have outlined these arguments in an earlier blog post on the Old English word earsling (the ancestor word of the popular insult ‘arseling’), which occurs only in the Paris Psalter (see: Arseling: A Word Coined by Alfred the Great? ). As this passage illustrates, Alfred added allegorical interpretations of some of the phrases in the Psalm. These additions resulted in the Old English text being a lot longer than the Latin original. As we shall see, this difference in length caused some problems for the scribe of the Paris Psalter. Scribe’s colophon © Paris, BnF, lat. 8824, ff. 186r. Hoc psalterii carmen inclyti regis dauid. Sacer d[e]i Wulfwinus (i[d est] cognom[en]to Cada) manu sua conscripsit. Quicumq[ue] legerit scriptu[m]. Anime sue expetiat uotum. Wulfwine’s nickname ‘Cada’ means something like ‘stout, lumpy person’ (he is, by no means, the only Anglo-Saxon with a silly nickname, see: Anglo-Saxon bynames: Old English nicknames from the Domesday Book). Left: Illustration of “Offer up the sacrifice of justice” (Ps. 4:6) © Paris, BnF, lat. 8824, fol. 3r; Right: The same scene in the Harley Psalter ©The British Library, Harley 603, fol. 2v. Could this Wulfwine ‘the scribe’ whose death was recorded in the late 11th-century Canterbury necrology really be the same person as scribe Wulfwine ‘the Lumpy’ who made the Paris Psalter and was inspired by at least two Canterbury manuscripts? As with the identification of Alfred the Great as the author of the prose translations, the evidence concerning the identity of the scribe Wulfwine is solely circumstantial, but the details do add up! In producing the pages of the Paris Psalter, Wulfwine ‘the Lumpy’ had one particular problem: the Old English prose translation in the right hand column was often longer than the Latin original in the left-hand column. Consequently, the left-hand column often featured some gaps. Initially, Wulfwine tried to fill these gaps with illustrations; later, he tried to fix the problem by wrapping the Latin text in an awkward way; until he finally gave up on the idea of filling the left-hand column and simply let the gaps stand. That Wulfwine eventually abandoned the idea of filling the gaps with illustrations is to be regretted. While some of his illustrations match the well-known Harley Psalter, others are unique to the Paris Psalter and shed an interesting light on how an Anglo-Saxon interpreted these Psalm texts. Below, I provide my personal top five of the fabulous illustrations of the Paris Psalter. Here, the artist has literally illustrated the Old English translation of Psalm 3:4: “þu ahefst upp min heafod” [you raise up my head]. I like how God gently seems to tickle the Psalmist under his beard. This illustration shows a rather less cute interaction between God and a human being. The bearded figure, in this case, must be one of the “yfelwillenda” [those who want evil] or the “unrihtwisan” [the unjust], and God is intending to use his mega-scissors to remove this person from his sight. 3) Lion got your soul? 2) Struck by Cupid’s..err Satan’s arrows! A depiction of Ps. 7:14 (he hath made ready his arrows for them that burn) shows Satan shooting an arrow into the heart of the female part of a lovers’ couple. Apparently, the couple had wild plans in their little love nest; note how the lovers are reaching between each other’s legs with their hands. These evil-doers and liars are not, as I first thought, taking a trip in a boat; they are, in fact, in the mouth of Hell (see its little eye-ball on the left). ‘If you pull my hair, I will stab your groin!’: Ouch!!! Emms, Richard. 1999. The scribe of the Paris Psalter. Anglo-Saxon England 28 (1999): 179-183. By thijsporck in Alfred the Great, Old English on March 6, 2017 .